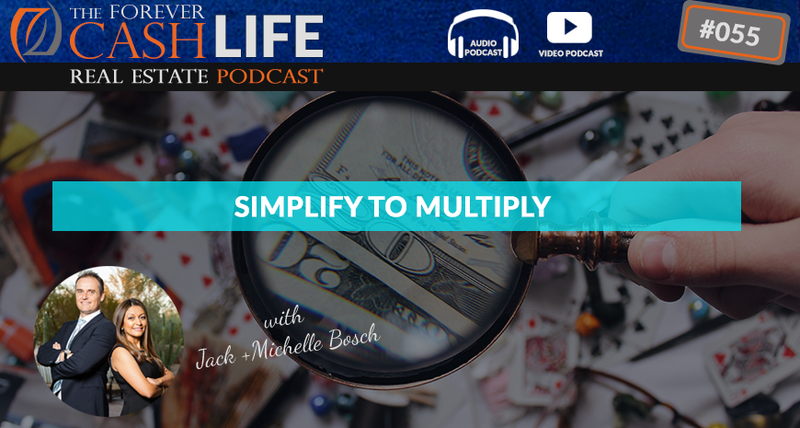 Michelle: Well, Jack has that…The other way around, it’s simplify to multiply. Jack: That works just though. Yes, that’s what we’re gonna talk about. Have I mentioned that I’m dyslexic? I actually am. I turn numbers around, I turn days around. Michelle: He really is. To his defense, he really is dyslexic. Jack: All right. Let’s get going. Male: Welcome to the “Forever Cash Live Real Estate Investing” podcast with your host, Jack and Michelle Bosch. Together, let’s uncover the secrets to building true wealth through real estate and living a purpose-driven life. Jack: All right. All right. We are back and she’s still laughing. That’s wonderful. So, that’s…We’re having fun here sitting in our home in our own studio. I really like the microphones. I like them, they’re really beautiful microphones. We got the lighting, we got the things going. I still have allergies so my eyes about that small, but that’s all right. Let’s talk about simplify to multiply. Right? Multiply to simplify. That would be a subject for another podcast and I wouldn’t even know what to say about it. Anyway, so let’s get going. Simplify to multiply. What do you mean by that? Michelle: Well, what I mean by that is don’t make…don’t complicate, you know, yourself by going after every shiny penny, by making things more difficult and more complicated than they need to be. And rather what I call hocus pocus focus on the few things. Jack: Okay. Hocus pocus focus. Okay. We will get into that one a little bit more. Michelle: So basically, what I mean is if you’re, you know, a land investor, you are…I don’t know. Maybe you’re experimenting in three, four different markets, and then you decide, “Okay. This is the one market that I’m gonna focus on.” Great, you’re simplifying to multiply. If you’re, you know, trying to do many markets at the same time, you are definitely gonna be stretched thin. And what I mean by that is that you’re gonna have to become an expert in so many different markets, different kinds of values, different kinds of properties that you will not have economies of scale and you will not be using your time and your energy efficiently, you know. So, there’s no economics of effort either. Jack: It’s a great point. So, simplify to multiply to me means focus on the one thing that works best, and on the one product that works best, and the one kind of property that works best, and the one kind of price range that works best, and the one kind of area that works best. And become the best there, and really multiply your profits in that case if we’re talking about it financially speaking. Michelle: And once you’ve mastered and you become an expert in that area maybe, you know, add a second area and so on. Jack: You add a second one and so on. And so, here’s something that in our Facebook group which is called My Open Path Official or also we might have renamed it by then already. We’re deciding whether or not to rename it back to Forever Cash Club because it’s the “Forever Cash Live” podcast, right? So, but either way if you look for My Open Path or Forever Cash, we’ll put it below in the show notes or in the comments below here, wherever you…the link to it so you can go there. If you join that group, there’s a lot of discussion going on. There’s several thousand people there in this group talking about land flipping, lot flipping, this alternative kind of real estate investing which is real estate without houses. And that in itself is a simplify to multiply strategy. Jack: Because instead of focusing on houses and rehabs, and this, and this, and this, we just chose to focus on one thing. And that one thing is simple land deals within, well, specifically properties between $10,000 and $100,000 that we can buy from 5 to 25 cents on the dollar and go cookie cutter model. Cookie cutter model, is it cookie cutter? It’s a true system. If it’s a true system, it’s a duplicatable business model that you can pluck people in and you can create a model that is profitable, and that you can grow without having to jump in all the time and come up with different kind of solutions. Michelle: And train people on different kinds of solutions. Jack: And there is different kind of solutions. So, out of that Facebook group, right? My Open Path, Forever Cash Club, there’s one question that pops out that really illustrates this piece very well. There’s one of our students who came and I had sent out some letters like we do, right? And gotten an answer back from somebody amongst other thing, lot of questions back. But one question was, “Hey, how do I buy…I got this contract or this request back from somebody whose property I think is worth $4.3 million. Should I take this deal on?” Now, a minute ago I just said, “Our average deal, our standard deal that we like to focus on is $10,000 to $100,000.” By now, perhaps $10,000 to $200,000 because prices have gone up in the market as well. But let’s say $10,000 to $200,000. Should he do a $4.3 million deal? Michelle: A buyer that is going to buy a farm and another, you know, piece of property is a completely different buyer than the one that we specialize on. Jack: …than the way you market the $25,000 to $40,000 property or $100,000 property. The way you do the conversations are different, where you go, the connections you have to be and you have to make, the networking you have to do, the entire marketing, the entire aspect of selling is a completely different ballgame than our cookie cutter model. So, my question to him was, so my comment to him was, “If you already have those kind of relationships, take it on. If you don’t then you have a choice, you could go after that deal and make perhaps $300,000, $400,000, $500,000 in that deal and that’s perhaps worth it. But you gotta be willing to abandon almost everything else and learn that for the next three months, and really go hard at this, and hopefully get that deal sold by that. And if you’re not willing to do that, if what you wanna do is keep your mind into something simple, then just forget about it.” Yes, it would be nice to buy a $4 million, $4.3 million property for $2.5 million and sell it for $3.5, but what it takes for it is a complete deviation of what you do. It’s no longer simplified to multiply. Now, it’s complicate to multiply and complicate to multiply it was gonna mean, more time, more effort. And no guarantees for that matter yet at the same time, keep it. So, if you keep it simple, you can make the same money and then say in a year or two by just focusing on the simple deals. Michelle: Now, if you have experience with that kind of property basically, then it’s a completely different ballpark. Michelle: Because then you have the sophistication and you know what it entails to basically exit out of such a property in that ballpark. Jack: Exactly. Apple is an expert at simplify to multiply. Apple doesn’t have 18 different phone models, Apple doesn’t have 18 different laptop models, Apple doesn’t have 18 different kind of other things. The only thing where Apple in my opinion deviated from that is with the Apple Watch because the Apple Watch has these vast amount of varieties. But you know what? The Apple Watch was created after Steve Jobs passed away. So therefore, the Apple Watch in my opinion is the first departure of Apple from their core philosophy of simplify to multiply. Still, there’s only two kind of them, the women [crosstalk 00:08:10] things. Michelle: It still does the same things that your phone does. Jack: It does, but they have so many different models. So, I personally think the big…the person who was…Here’s the thing, it requires a lot of discipline to simplify and multiply. That’s really where I’m going with this. And Steve Job was one of the most amazing people in that regard. Apparently, in other regards he was very much of an idiot, but in that regard he was absolutely incredible. And that he was constantly focusing on simplify, simplify, simplify. “We don’t offer 2,500. We’re not the Walmart. We offer a MacBook, we offer an iMac, we offer all these things, but one product. Perhaps in two or three variations, but that’s it, not a million variations.” And that requires discipline because the shiny penny is everywhere. Jack: And that’s by the way, gonna get you from zero to half a million or million or something in revenue. Jack: “I need to hunt, I need to pay the bills. And anything comes my way, yes, I’ll do it, yes, I’ll do it, yes, I’ll do it.” And that works to pay the bills for a while. But in order to grow to another level, you gotta simplify to multiply. You gotta focus on something, you gotta become a specialist to just do certain things and do them extremely well. And that allows you to grow like crazy. So, yeah, that’s absolutely true. Jack: And that applies to everything. Sorry. Go ahead. Jack: It becomes easier, the outsourcing becomes easier. The creating roles in your company, it would become easier because they don’t have…they only have to learn one model, not 25 models that they have to know when to apply which model. It’s one model. So, simplify to multiply works and that brings us to actually another part of it. It works in the land area. Michelle: In the land investing. Jack: It works to a degree in the house area even though every house is different, right? Now, the successful house flippers, they have a simplify to multiply model and that they have the exact same color that goes up on the wall. Michelle: And it’s a cookie cutter within a specific price range of house. Michelle: Because, you know, different price range of house would require different materials of course. Jack: Right, right. Within the price. Particularly the bottom third of the price range, you can get a way with getting the same exact product into the luxury area, that no longer works, right? But that even works in multifamily. I don’t know if you know, but, I mean, you do. But I don’t know if everyone knows that we’re also doing multifamily. So we’ve created the simplify to multiply model in our land flipping business. We created it in our educational side of things where we teach people how to buy these land pieces because even there, we fell into that trap, the shiny penny. We had our land course since 2009, the first ever land course in the entire United States industry. We were the founders of this. We are still the original land couple, right? Jack: The original land people, Michelle and Jack. And we never…And then all of a sudden we started getting sucked into additional things. People was like, “What else do you have?” I was like, “Well, we have nothing else because this is how 95% or 97% of our deals are done.” Well, we have done some tax lien deals. We have some deals through access proceeds, we have done some deals, house wholesale deals and rehabs, and other things like that. So, soon enough we created courses for all these different things, but they ended up being a distraction from what our core expertise is. And our core expertise, there are great courses. If you have them, you got a great course. But they also, they became a distraction to our business, they became a distraction to customer service team, they became a distraction to everyone involved because they all knew us as the land people, not as all these other stuff. So as of a year, a year and a half, or two years ago, basically, we killed all these other products. We kill them all off. We went back to just being the land people because you know what, that’s the most fun. That’s where all the profits are made and that’s where all the house people are not going. Because why would they, I mean, why would…I don’t still don’t understand why they don’t go there because why would somebody deal with junkie cockroach filled houses that they have to rehab that there was always surprises coming up. Rehabs go over time and over budget. Or if they do a wholesale, they still have to meet the seller there, there’s huge competition. There is less profits than we make on the land deals, and our students make on our land deals. And they have to deal with all those different things when in the land, in the lot area, you have to deal with the seller doesn’t want the property anymore, the property, you, and the buyer. That’s it. Jack: That’s as simple as it is. Anyway, I got distracted here. A little rant here going, but the the thing is simplify to multiply. So, when we add a multifamily to it, we decided that even though it’s an addition, we have decided that it’s an addition because for personal growth and because it also fits into our end game which we talked about in one or two podcast ago. So, you can check those out, episode 48, 49 or something like that, or 50. It should be about the means versus end goal. And so, even in the multifamily, the first thing we did is we focus on a niche. And what’s the niche that we’re focusing on? Michelle: C plus and B properties in specific markets, of course. Jack: C, C plus, and B properties, and specific markets in a very exact model. We don’t buy run down properties that are empty. Michelle: Anything under a hundred units. Jack: We don’t buy properties that need to be completely…that’s completely rehabbed, left and right in order to make the livable. We don’t deal with that. We only focus on properties 100 or let’s say 90 units plus. What that? Because they’re big enough so that we have professional full-time property management in it. Why then we’re looking for properties that are mismanaged to some degree, but still have high occupancy? Why that? Because they provide cash flow from day one. All right? So, our investors get a return from day one, they get a cash flow returned from day one. And then we gradually go and we improve pieces on their property, right? The deal we have on our contract right now, we gonna gradually go and improve the…upgrade the models and the properties inside with a updated kitchen, updated appliances, updated flooring, and updated bathrooms, right? Jack: Right. There’s still many people in that property right now. Michelle: Once these small things that Jack just mention are taking care of, you know, all properties surrounding our property are commanding higher rates and once our property, you know, has been renovated, we’ll be able to command higher rates, existing rates. We’re not hoping that rates are gonna go up. They’re already there. Jack: We’re not interested because we can’t put full-time management in there. Michelle: And it requires a lot of discipline because we already have had people reaching out to us saying, you know, “I have this property. Would you like to, you know, partner with me?” And it’s not fitting this one box. And therefore, it would complicate things for us. So, no complications, simplification. Jack: That way our investors know exactly what they’re looking at us. They know when we come to them with the deal, the deal always fits that exact box. And if they’re looking for that box, if they look for cash flow for investment with a big piece of the upside and the back, then they know they’re at the right place. Because for the foreseeable time period until… I don’t know until when, but for the foreseeable time period, that’s the exact model that we’re looking at. That allows us to go to brokers and talk to brokers, and say to brokers particularly and tell them, “This is the exact model that we’re looking at. If it doesn’t fit this box, don’t even show it to us.” That cuts down on our effort in looking at these properties. Michelle: Not only in looking, but in communicating to the brokers because you have just kinda like a script like, “This is what I’m looking for.” And you basically become an expert in this conversation because this is what we’re after. Jack: Right. Exactly right. So at the end, the simplify to multiply model helps you in every aspect of business. It helps get clarity the about what you want, but it does require discipline. Because a discipline is that everyday somebody else wants to put their agenda on top of you, everyday somebody else wants to give you their deals and sell them to you as the best deal in the country. And, yes, you can make money at those deals. But just because you can make money doesn’t mean you should do them [inaudible 00:19:24]. You only should do the deals that absolutely makes sense to you that you’re comfortable with and we are comfortable with cash flow deals. All right. Jack: I think that explains the simplify to multiply model pretty well. Michelle: Yeah. I think so. And remember, hocus pocus focus. Jack: Remember, hocus pocus focus. Again, for that, again, as always we’ll have a little intro, but in the meantime make sure you go below here, put in your comments. If you haven’t subscribed to our YouTube channel, go check it out. We’ll show it on the screen in just a moment. Make sure you go to our Facebook group and go Facebook page, Jack Bosch and like the page. Go join our group, My Open Path or Forever Cash Club, whichever one, we’ll put it below here. And leave us a five-star review for the podcast by going to jackbosch.com/podcast. All right? Thank you very much. Michelle: Good luck to everyone. Jack: …land flipping, go the landprofitgenerator.com. And if you wanna know more about investing, go to orbitinvestment.com. All right? And apartment complexes. All right. With that, bye, bye.